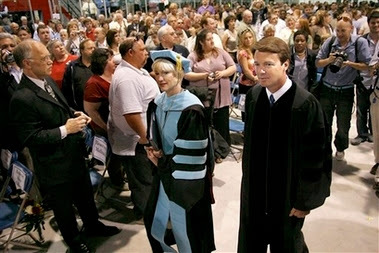 John Edwards Calls to End Iraq War- Plugs New Website During Commencement Speech! Remember… Absolutely nothing is off limits for liberals… Nothing. Edwards calls to End the War in Iraq… He calls for mass protests!… And, he finds time to plug his new website while he’s at it! Democratic presidential hopeful John Edwards used a commencement address today to call for an end to the war in Iraq. He challenged the graduates of New England College to support him. Edwards’ speech comes on the same day he launched a new Web site, www.supportthetroopsendthewar.com. The site outlines his plan to end the unpopular, four-year-old war. Edwards says young people have brought changes before, citing civil rights and the end of the Vietnam War. Here’s the video from his new website that he plugged today during his commencement speech. So, November was about “ending the war” or was it about “a new direction”… which is it? “Each of us has a responsibility as an American, as a duty to our troops and to each other, to do every single thing we can to support those troops and end this war,” Edwards said. He said young people helped to bring about civil rights, end the Vietnam war and promote anti-Apartheid causes. He said anything less is a failure. Nothing is off limits to liberals in this country. Nothing! But I do think that the more serious question going forward is, what are we going to do? I mean, we have three different countries that, while they all present serious problems for the United States — they’re dictatorships, they’re involved in the development and proliferation of weapons of mass destruction — you know, the most imminent, clear and present threat to our country is not the same from those three countries. I think Iraq is the most serious and imminent threat to our country. And I think they — as a result, we have to, as we go forward and as we develop policies about how we’re going to deal with each of these countries and what action, if any, we’re going to take with respect to them, I think each of them have to be dealt with on their own merits. And they do, in my judgment, present different threats. And I think Iraq and Saddam Hussein present the most serious and most imminent threat.